August is always a little crazy for markets and last week was no exception. Comex gold stumbled clumsily below its 200-day average as global tensions eased and safe haven money returned to record breaking U.S. stocks. Friday the yellow metal recovered some from Thursday’s 2-month low ($1,273.4) to close at $1,280.2 per ounce. On Thursday, the S&P500 made its all-time closing high of 1,992.37; this morning it has topped the mercurial 2,000-level as gold notches lower still. The week ended with speeches by Federal Reserve Chairman Janet Yellen and her European counterpart Mario Draghi at the annual Jackson Hole meeting of central bankers. There were no unanticipated revelations about monetary policy leaving the markets relatively unperturbed. One benefactor was the U.S. dollar which strengthened on a falling euro and a weakening Japanese currency; on Friday the yen breached 104. Even with a strong U.S. dollar, Comex copper became the star metal, up a solid 3.3% for the week as Nymex (WTI) oil fell to $93 per barrel territory - a drop of 4%. Copper needed a bump after skirting near the key $3 per pound ($6,600 per tonne) level on August 14. On that day I asked Janet Mirasola, Managing Director of the Wells Fargo Securities Metals Group, "Could copper drop below $6,600 on waning QE3, contracting Germany, wobbly China and slower US growth?" She replied, "Should be the first test – let's see what the macro picture looks like when we get there." Not there yet, Comex copper closed at a healthy $3.2045 per pound and is up again in morning trading. What’s troubling is that Ms. Mirasola’s answer included “when” and not “if.” Is the red metal rebound just summer volatility? The bigger picture portrays an overall slump in commodities. The Goldman Sachs Commodity Index (GSCI), which includes everything from copper to cattle, has been plumbing 52-week lows lately. However, until gold's latest retreat, the yellow metal has stayed above $1,300 per pound on a broad array of geopolitical concerns (Russia/Ukraine, ISIS, Israel/Hamas etc.). This creates a premium for gold compared to most other commodities. Looking at oil, copper and gold from a comparative perspective yields some clues as to what may lie ahead. I use gold ratios to directly value gold, a technique as old as the Phoenician trader’s barter, “this much copper for this much gold.” For example, the dollar price of gold divided by the dollar price of the red metal gives a valuation of so many pounds of copper for one ounce of gold. Conveniently, currencies disappear from such comparisons. The Eureka Miner Gold Value Index©, or GVI, combines gold ratios of industrial commodities oil and copper and precious metal silver together with their historical norms. The result is an index that that sorts gold premium from discount and has shown to be 40% less volatile than U.S. dollar price. Scaling gold price by the GVI provides a commodity value for gold in U.S. dollars as shown in the chart of Fig. 1. In July 2006, Comex gold price (blue trace) was in the mid-$700 range. 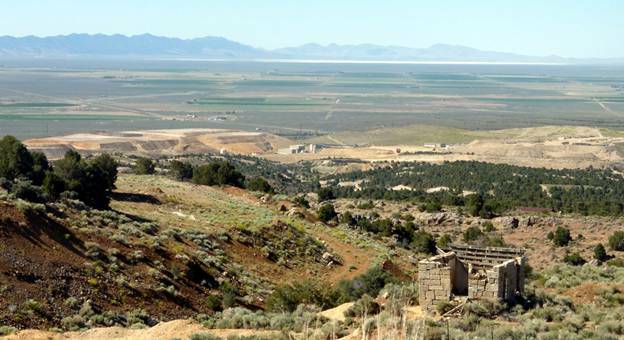 One ounce bought 10 barrels of crude oil, 200 pounds of copper and 55-plus ounces of silver. Even with all the price and value carnage of 2013, Friday’s $1,280 gold buys more of the same commodities: 13.7 barrels of oil, 400 pounds of copper and 66 ounces of silver. The commodity value of gold (red trace) has risen with price over the last eight years. In November 2010, key commodity ratios returned to near historical norms and enjoyed a period of rock sold stability following the price turbulence of the Great Recession – the price and commodity value of the yellow metal reached equilibrium (red & blue traces came together). 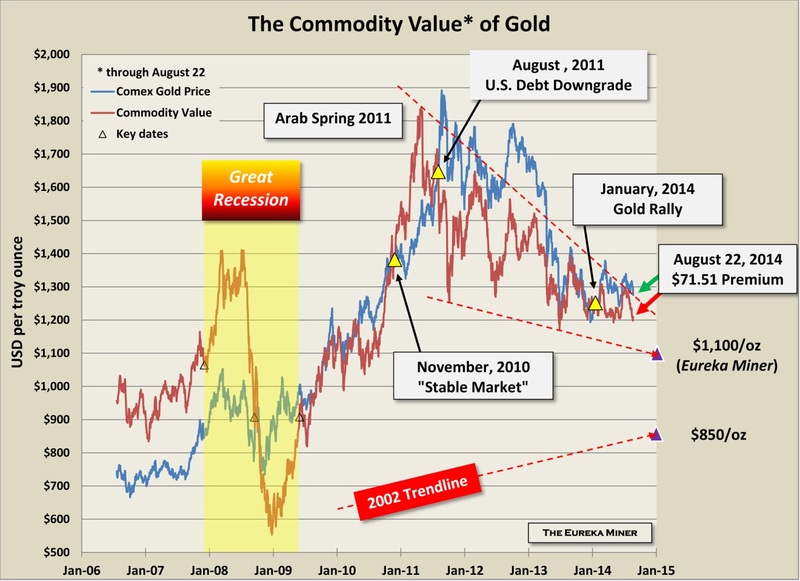 By this definition, gold traded at a discount to key commodities prior to the Great Recession (red trace above blue). After the recession, gold has mostly enjoyed a premium (blue trace above red). A notable exception occurred during the second phase of U.S. Federal Reserve quantitative easing, or QE2, when overzealous global growth expectations inflated the price of copper and Arab Spring spiked the price of oil in early 2011. Gold returned to discount shortly after the November “stable market” but flipped again to premium in the summer of 2011 following the end of QE2 and the disastrous U.S. debt downgrade that August. After setting its all-time $1,920-plus record price in September 2011, yellow metal price and premium declined as fear left the market and investment money favored high-flying equity markets over commodities. Gold value and price converged in the fall of 2013 and plumbed sub-$1,200 lows before year-end. This year’s gold rally started in January lifting gold price to nearly $1,400 per ounce by St. Paddy’s Day on concerns about emerging market currencies, China growth and, later, the Russia/Ukraine crisis. As glitter made new highs, copper dipped ominously below $3 per pound boosting gold’s premium over its commodity value (blue trace above red again). With the Russia/Ukraine crisis joined with other regional conflicts, the pattern repeated with Comex gold’s high of $1,347.5 in July, followed by Comex copper’s low of $3.0825 in August. On August 14, the gold premium peaked at $100 per ounce. This has slowly narrowed to a spread of about $70 between gold price and commodity value at Friday’s close (green and red arrows). If the premium continues to decline, gold will follow commodities on a downhill slope in U.S. dollar price. What’s next? Beyond the volatility caused by geopolitics and evolving central bank policies, Fig. 1 shows a startling “value compression” from Arab Spring 2011 to the present (dashed red lines extended to the end of this year). It is important to note that actual gold price has not strayed too far from this declining and narrowing wedge since April 2013. This suggests a range of $1,100 to $1,210 per ounce for year-end gold prices. The declining wedge of Fig. 1 implies that the lower range of gold price at year-end will be bearishly lower, not higher, than that of December 2013. A more bullish take on this chart is to note that the commodity value lows, as well as the U.S. dollar price lows, are above the December dip. This view suggests that a bottoming process for gold may be in play. The test of a bullish thesis for gold is to take out the July high ($1,347.5) and sustain prices above $1,350 per ounce. This would be a clear break from the declining value wedge. The U.S. is presently blessed with abundant but expensive oil. There is some consensus that this will limit domestic oil prices from falling much below $90 per barrel, a point at which production is quickly shut-in. For the sake of argument, assume copper falls below the Mirasola “first test” at $6,600 per tonne to test its March low – say $6,280 or $2.85 per pound. The key $1,350 level for gold would then imply a commodity value of $1,170 - near the middle of the value wedge by year-end (note 1). The premium for gold for this scenario is a sobering $180 per ounce. This exceeds by $30 the premium achieved during the scariest moments of the year so far. A forecast that includes falling oil and copper prices and gold exceeding $1,350 seems unlikely unless Santa brings a lot of “macro-picture” coal in December. Expecting commodity prices to reverse and reach 2014 highs by year-end is also a stretch in the current environment. Using Comex copper’s January high ($3.38) and Nymex oil’s June peak ($105.55), the commodity value of gold is roughly $1,300 with a $50 premium. Above the wedge? Yes. Likely? No. It is doubtful that gold or commodities will reach escape velocity from value compression until inflation expectations rise and the global outlook improves. From the heart of North American Gold country – Cheers! Note 1: For this analysis, it is assumed that the gold-to-silver ratio remains unchanged at Friday’s closing value of 66 ounce per ounce.